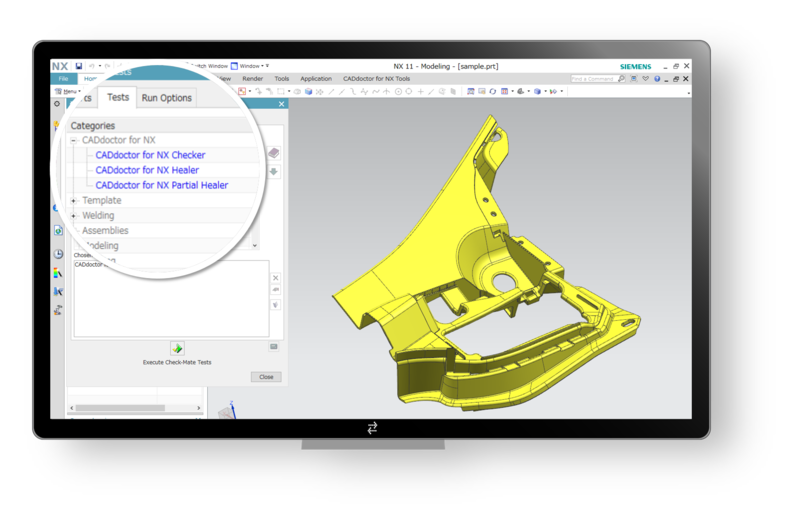 CADdoctor for NX works directly in Siemens NX to help you ensure Product Data Quality and healing corrupted models while importing into NX. Adopting CADdoctor for NX in the early design phase will help NX users at any level improve efficiency throughout the manufacturing enterprise. Because data accuracy reverberates all the way down the supply chain, profoundly affecting every stage of product lifecycle management (PLM). The product name of ‘NXdoctor’ has been changed to ‘CADdoctor for NX’ from its version 1.2. NX users can operate PDQ verification using ‘Check-Mate’. Based on Elysium’s years of experience, and in light of NX’s specialties, CADdoctor for NX ensures reliable PDQ verification. It allows users to verify 27 critical check items including 20 most important items complies with SASIG. Elysium’s accumulated CAD data healing technology enables to automatically regenerate perfect NX data. CADdoctor for NX provides functions to not simply remove errors, but to thoroughly review and repair the geometry so that the CAD data can be utilized in the next stage in the CAD data flow. Input and output Elysium Neutral File (ENF) allows CADdoctor for NX repair results to be used freely on CADdoctor or ASFALIS.